The 223 Remington, invented in 1964, is one of the most popular rounds in the world. 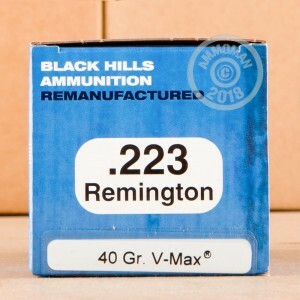 As the parent case of the 5.56x45mm military cartridge, the 223 Remington is a very versatile round and is a great choice for plinking, hunting, self defense, and match shooting. 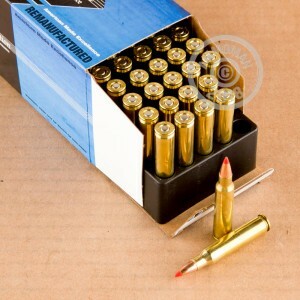 Black Hills is a high quality ammo manufacturer, making very accurate products. 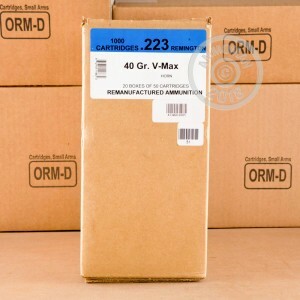 Branches of the US Military buy match grade ammunition from this company for their long distance competitions. Black Hills factory re-manufactured rounds are perfect for shooters who want a high quality cartridge at an affordable price. These re-manufactured rounds feature Hornady's famous V-Max bullets that deliver the explosive expansion, accuracy, and speed you need to hunt varmints. Need more than 50 rounds? At AmmoMan.com all orders over $99 will ship for FREE! So stock up and save!